Rustic. French Country. We Build Authentic. Once we source the right kind of wood we inspect its health, grade it, and run it through a weather treating and conditioning process. Then our woodworkers and custom driveway gate team gets together to create your original, one-of-a-kind design that will compliment your home’s look and represent your style. Organic – Wood is wood; there are no other materials in it that have been manufactured. It is natural in its raw form, and organic design elements are hot in terms of architectural design, and this style doesn’t seem like it will go out of style anytime soon. Options – There are more options for wood than metal. Each type of wood has its own tint, color, grain, pattern, sheen, and texture. Altercations – If you decide you want to have some custom altercations done (like adding wrought iron designs on the wooden gate) making changes with a wooden gate as your platform is much easier than starting with a metal gate. Warmth – Many people choose wooden gates because they feel metal offers a cold feel and they prefer to gravitate to a feeling of warmth. Metal gates are great options for many people, but the fact remains that most people choose custom wooden gates. Everest is proud to offer customers affordable prices on the highest quality custom wooden gates in LA, and we strive to make sure our prices are the lowest. Each gate is a work of art, and an original work that no other homeowner has, or ever will. Whether you want a Western style gate for your horse ranch, or a modern wooden gate with board planks and clean lines, give our team at Everest a call, and let’s bring your design to life! Wooden Swing Gates – A swing gate requires more room so they can open and close without obstruction. They are also generally lower in cost because they have a more simplified gate automation system. You also need a flat surface for custom wooden swing gates, so if your driveway is on a hill you will need to consider other options. You also need to make sure the gate won’t open onto a public sidewalk or into traffic. Our customers love the traditional look of swing gates, making them very popular options for those who have the right landscape. Sliding Wooden Gates – Sliding gates are great for homeowners with limited space because they take up virtually zero room when opening and closing. 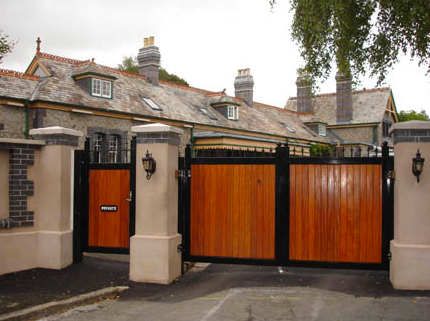 Our wooden sliding gates are the most popular options for homes with driveways on a hill or at an angle. Customers who want added security love sliding gates because they are stronger than swing gates and offer better security against forced impact entry attempts. Sliding gates are also popular with pet owners, as there have been many pet fatalities caused when poor little animals get stuck in the swing gate. Barrier Gates – Definitely the least popular of driveway gates, a barrier gate is not meant to keep intruders out but instead to control traffic coming in and out of your property. These are the types of gates you see at a toll booth in which an arm raises to grant vehicle access before lowering back down. If you are not worried about foot traffic but more so you want moderate security to control vehicle entry, a custom wooden barrier gate may be a good option. Low cost, high-quality, craftsmanship at its finest–these are just three reasons why Los Angeles homeowners turn to Everest for luxury driveway gates that are custom made. Our custom wooden gates team have studied advanced woodworking and artistry, making them the best technical artists to create the one-of-a-kind driveway gate that will make your property pop on the street. We can carve any monogram or design into your gate, brand designs, and incorporate elements of metal, stone, or other materials. Whether you want an intricate head-turner with hand-carved designs, or something clean and sleek, call Everest and let us give you the best price on high-quality custom wooden gates that will add prestige to your property while giving you ultimate security.